Today I went to the Townsville Aquarium. It's fantastic. If you ever find yourself in Townsville with a few hours to spare, go and have a look. You'll need at least three hours - I only had two, and it wasn't enough. I have been told that it's not PC to go to aquariums - I mean aquaria - but I think that's crap. So much of what the guides and exhibits were saying today was a very thinly veiled exhortation to be environmentally responsible, from pleas for not dumping plastic bags to the impact of the warming of the oceans on the barrier reef. The benefits of the existence of an aquarium has to outweigh the negatives...which I presume are concerns for captured fish... Although not ideal I'm sure, I'm less concerned about zebra fish trapped in tanks the size of swimming pools than I am about bears kept in cages and milked for bile, for instance. I saw Australia's only known furry musical crayfish. Or was that a musical furry crayfish? Anyway it's a true animal I swear! (I didn't believe in tree kangaroos, when I first heard of them - I thought my friend, who was a zookeeper, was pulling my leg). Its existence in Australia was postulated in 1992 following its discovery in Samoa, or Tonga or somewhere, but this is the first one captured off Australian waters. (They presume that others have been captured and eaten before their pedigree is established) It didn't look particularly furry, crouched in its watery cavern; and I couldn't hear it singing, but the sign next to its enclosure assured me that it rubs some of its bits agains some of its other bits and makes a noise similar to a cricket. The other marvellous creature I saw was this green turtle. It's a white green turtle, green turtle being its species, and this turtle lacking some important skin enzyme. 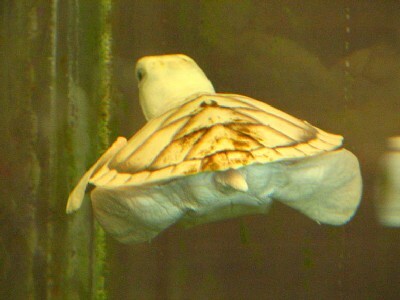 But even correctly coloured green turtles aren't green, they're a kind of splotchy brown. 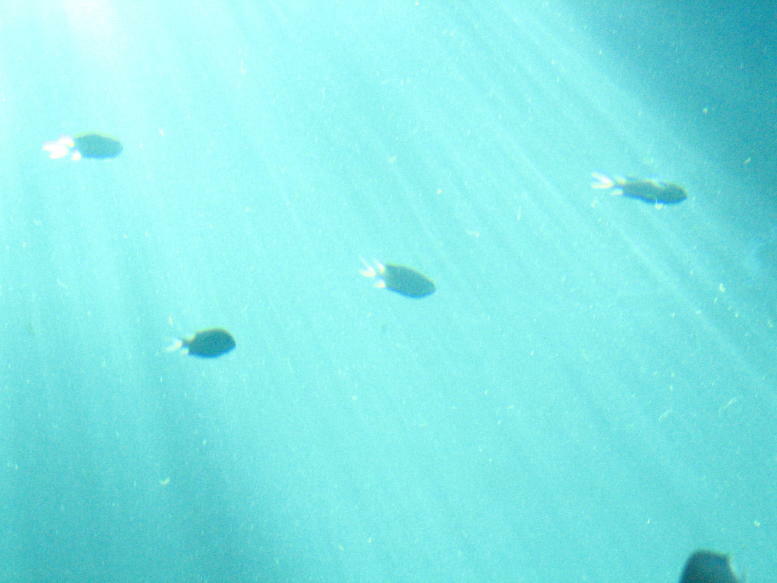 They are called green turtles because their flesh is green, because they eat seaweed. (This is starting to sound like a primary school essay). Green turtles were otherwise known as soup turtles. Isn't that terrible, to be named after the dish you will be turned into? They are now endangered. Too much soup. Anyway this little turtle is just a baby, and was rescued by wildlife carers. 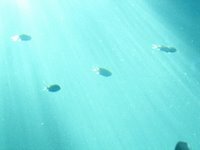 The aquarium is trying to get a permit to keep it as they don't think a white turtle would survive long in the ocean - looks too tasty. They are also worried it would get horribly sunburnt, out in the open ocean under the Pacific sky!